Visions of a Volcanic Eruption? Two girls from a village called Zaro on the island of Ischia in Italy have asserted that the Blessed Mother appeared to them on October 8, 1994, prophesying the events of September 11 seven years before they occurred. The alleged visonaries, Simona Patalano and Simona Impagliazzi, who were nine and 11 at the onset of the apparitions, have claimed that Mary appears to them in a forested area, where they began a routine of gathering every Wednesday, Saturday, and Sunday to pray, along with the 8th and 26th of each month, in commemoration of aspects of the apparition. Spirit Daily has not yet been able to update the situation -- but according to a report based in a local newspaper called Epoca, which first reported on the situation in 1995, and another, Il Golfo, which carried a report on January 10, 2002, the Virgin purportedly has shown herself to the young women as both Our Lady of Fatima and Our Lady of Lourdes, though not dispensing any messages or prophecies under those particular appearances. During the apparition in 1994, the girls say Mary showed them the Twin Towers, how they would be attacked, and the collapse -- as well as an attack on the Statue of Liberty (which of course did not ensue, although such may once have been in the plans of terrorists). We submit this for your discernment. There have also been reports of recent apparitions with similarly sober prophecies from Oliveto Citra south of Naples and elsewhere in Italy; those we will review in coming days. According to the Epoca report, a local priest at Ischia, Don Franco Patalano, appeared skeptical of the girls' claims and accused the newspaper of seeking a "scoop" instead of doing what he advised: ignoring the situation. In speaking to reporter Frederica Raimondi, Father Patalano said the girls had been directed to report messages or anything directly to him and no one else. "If roses bloom, they will bloom," he commented -- a local idiom apparently expressing the view that if the apparitions were true, word would eventually be disseminated no matter what anyone did. Allegedly, the Virgin at times spoke in languages unknown to the girls -- German, English, and Aramaic, the latter an ancient language of Israel -- and in addition to showing them how the two buildings would collapse, granted Simona Patalano the vision of a volcano erupting in the future on an unidentified island. 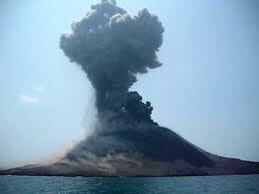 The girl said she was shown the eruption of lava, people attempting in vain to flee, and the island disappearing beneath the ocean. Ischia located off the Gulf of Napoli, some twenty miles southwest of Napoli and slightly more than that west of Vesuvius. Its highest peak, Epomeo, is not a volcano -- but numerous recent and historic eruptive centers are scattered on its flanks, the most recent of which formed in the 1300s. Continuing volcano-tectonic activity was destructively demonstrated on 28 July 1883, when the famous thermal resort of Casamicciola was leveled by the most violent in a series of local earthquakes -- killing more than 2,213 people on the very island where the visions are now occurring. This history may account for the fears of the girls -- although it should also be noted that it is an area of the world where volcanoes like Vesuvius and Etna have caused cataclysmic events, and where, to the east, in the Aegean, the island of Santorin or "Thera" served as the location of one of history's great volcanic disasters during Minoan times -- an event estimated to have been 40 times more powerful than Mount St. Helens. In Italy itself, Vesuvius caused the ruin of Pompeii not long after the time of Christ. Interestingly, the Holy Father, Pope John Paul II, visited Ischia for a youth rally in the days leading up to World Youth Day in Toronto. We can't verify that the prophecies were made before the events of September 11-- the girls say they paid them little heed until the tragedy actually occurred -- and as news accounts point out, no one can know the full truth for certain but the young women themselves. Only they know what they actually saw or didn't see. Of course the most interesting aspect of this prophecy is the fact that it points to the time of the Second Pentecost to twelve years past the millennium - the year 2012. This would thus correspond with the contention of various commentators on the 2012 phenomenon that the Maya believed that this period would mark a major shift in spiritual thought, rather than being the date of a world-destroying cataclysm. Given that the above prophecy foretells the emergence of the Worthy Shepherd (who is equated with the Angelic Pope) to restore the Church twelve years after the turn of the millennium, it would thus appear to suggest that a papal election would take place during this year. This leaves us to wonder if this prophecy is the true source of the "assassination plot" furore concerning Cardinal Romeo brought to light by the Vatileaks scandal at the start of the year? In the earlier post concerning this controversy which you can find here, I suggested that Cardinal Romeo may have based his musings that a new pope would be elected sometime in 2012 on a prophetic source of information, rather than being privy to the details of some assassination plot, as was suggested by certain elements within the Italian media. At the time, I pondered if there was a date pointing to the year 2012 in the theoretical "hidden text" of Fatima. Now in retrospect, it seems that if Card. Romeo did base his speculations on a specific prophecy, it would almost certainly be that of Bl. Tomasuccio de Foligno. If we look at the exact wording of the prophecy however, it doesn't necessarily imply that a papal election would take place during the course of this year. The only thing it explicitly states is that the Church would be renewed at this date, and that this would mark the beginning of the return of schismatics to the Church at the Second Pentecost, under the leadership of the Worthy Shepherd/Angelic Pope. I suppose the only real way of authenticating this prophecy is by waiting until the end of the year to see if anything takes place. Of further interest is the fact that the Worthy Shepherd Prophecy also depicts the Church as the Bark of St. Peter being battered by storms during this time period - which is highly reminiscent of St. John Bosco's Dream of the Two Pillars. 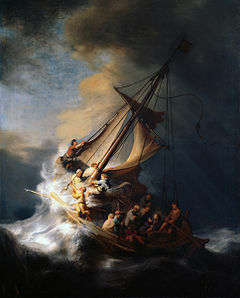 When the storm batters the ship, filling it with water (symbolising the Great Apostasy), the disciples begin to lose faith, fearing because Jesus appears to have been slumbering and unresponsive. Yet Christ is always present in the Bark of St. Peter, even if at times he seems as if he is asleep. At this point, a great convulsion takes place. All the ships that until then had fought against the Pope’s ship are scattered; they flee away, collide and break to pieces one against another. Some sink and try to sink others. 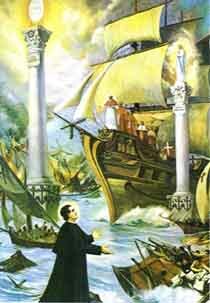 Several small ships that had fought gallantly for the Pope race to be the first to bind themselves to those two columns. Many other ships, having retreated through fear of the battle, cautiously watch from far away; the wrecks of the broken ships having been scattered in the whirlpools of the sea, they in their turn sail in good earnest to those two columns, and having reached them, they make themselves fast to the hooks hanging down from them and their they remain safe, together with the principal ship, on which is the Pope. Over the sea their reigns a great calm. (Letter to Werner von Kirchheim and his Priestly Community: PL 197, 269ff.). The image of the woman before the altar in front of the eyes of God that I saw earlier was now also shown to me again so that I could also see her from the navel down. From the navel to the groin she had various scaly spots. In her [genitalia] there appeared a monstrous and totally black head with fiery eyes, ears like the ears of a donkey, nostrils and mouth like those of a lion, gnashing with vast open mouth and sharpening its horrible iron teeth in a horrid manner. From that head to the knees the image was white and red, bruised as with many a beating. From the knees to the two white transverse zones which crosswise seemed to touch the bottoms of the feet from above, the image appeared to be bloody. Lo, the monstrous head removed itself from its place with so great a crash that the entire image of the woman was shaken in all its members. Something like a a great mass of much dung was joined to the head; then, lifting itself upon a mountain, it attempted to ascend to the height of heaven. A stroke like thunder came suddenly and the head was repelled with such strength that it both fell from the mountain and gave up the ghost. After this a stinking cloud suddenly enveloped the whole mountain. The head was surrounded with such great filth in the cloud that the people standing by were struck with the greatest terror as the cloud stayed upon the mountain somewhat longer. The people standing there beheld it and struck with much fear said to each other: " Woe! Woe! What is this? What does that seem to be? Who will help us, unfortunate as we are? Who will deliver us? We are ignorant of how we have been deceived. Almighty God, have mercy on us. Let us, oh let us return. Let us prepare the covenant of Christ's Gospel, since we have been bitterly deceived." Behold, the feet of the aforementioned female image appeared to be white, giving out a brightness above that of the sun. I heard a voice from heaven saying to me: "Even though all things on earth are tending toward their end, so hardships and calamities is bowed down to its End, nevertheless, the Spouse of my Son, though much weakened in her children, will never be destroyed either by the heralds of the Son of Perdition or by the Destroyer himself, however much she will be attacked by them. At the End of time she will arise more powerful and more secure; she will appear more beautiful and shining so that she may go forth in this way more sweetly and more agreeably to the embraces of her Beloved. The vision which you saw signifies all this in mystic fashion." Jamey Srdarov recently put up a rather detailed (and very generous) review of Unveiling the Apocalypse on amazon.com, which I thought would be worth sharing with readers of this blog (you can find the original review here). It is an excellent summary of the book, and gives any potential readers a good idea of the main contents and topics covered. This review is lengthy, given the complex and unique nature of the book I would like to do it justice particularly given it focuses on themes usually hijacked by crackpots. The holy pope St Pius X at the dawn of the 20th century saw signs that the "Son of Perdition" may already be in the world given the degradation of society at the time. Since then we witnessed the bloodiest century in human history, the widespread killing of unborn babies (not to mention the ghoulish experiments performed on those aborted alive), the breakdown of the family unit, unprecedented material prosperity and greed in the West, and the great scandal and apostasy that has swept the Catholic Church over the past 50 years. Given all this many do believe with good reason these are the end times or at least a critical phase in salvation history. For Catholics there is further reason to believe these are the last days as both Pope Paul VI and Pope Benedict XVI (as then Cardinal Ratzinger) have said the Third Secret of Fatima involves the end times and Sr Lucia herself said it relates to Revelation 8-13. Given things are going pear-shaped we turn to the Book of Revelation and don't know what to make of it all. Enter Emmett O'Regan's Unveiling The Apocalypse. This book is a God send to Catholics and others interested in prophecy because O'Regan's analysis of biblical end times prophecy has a focus on current events and also incorporates the most trustworthy visions of the great Catholic saints down the centuries (e.g. St John Bosco's Two Pillars, St Malachy's Prophecy of the Popes) and the Marian apparitions of the past 150 years all integrated in a logical framework. The author has shown discernment as to which prophecies and visions were included, for example he only uses Church approved Marian apparitions and avoids those condemned or not ruled upon. The visions of saints used whilst not having had the Church make a decision upon them are solid. Adding to the quality of the work painstaking research has been done to sort fact from fiction in regard to the sources of many prophecies. For example Yves Dupont's Catholic Prophecy: The Coming Chastisement contains reference to many prophecies however the original sources for many of those cannot be historically traced back to the supposed saint/seer, O'Regan highlights which of the famous prophecies can be traced back reliably and which appear spurious. For example he does a great job covering the history of St Malachy's Prophecy of the Popes and the pros and cons of the legitimacy of this prophecy. Likewise he tackles atheists debunking attempts on major Marian apparitions such as Fatima and Zeitoun highlighting the superficial nature of their arguments. In the Preface and Introduction discussed is the structure and method used in Revelation which is critical in interpreting and understanding the mystical book correctly, hence giving the reader a firm theological grounding. With Revelation there is no "set form of chronological sequence, it is arranged thematically rather than chronologically". He discusses the typical Fundamentalist view of dispensationalism which uses a linear approach and subsequently adopts the heresy of premillennialism and then provides a fantastic quote by E.S. Fiorenza that "the structure of Revelation is best conceived pictorially as a conical spiral - a twisting recapitulatory configuration while driving the narrative forward, also reveals new insights into previously revealed information". He goes on to discuss the preterist view which is how most mainstream Catholic theologians seem to approach the book of Revelation - i.e. focusing on events that happened during St John's time, in particular the destruction of Jerusalem. Then there is the futurist approach which involves interpreting Revelation in light of future events which seems to be deterred in Catholic academia. O'Regan uses both approaches and makes no apologies for his futurist interpretation, yes many of those things in Revelation refer to first century events but the book has multiple layers of meaning and one text can actually refer to two separate meanings/events. Unveiling the Apocalypse has a strong focus on events of the past century in relation to the end times. In particular the author focused on the mass apparitions of the Blessed Mother in Egypt in the past 40 years, signs of the sky phenomena which occurred around the turn of the millennium, the widespread slaughter of innocent babies and broken souls the legalisation of abortion has led to, and discusses some of the remarkable coincidences these events have with Revelation and other biblical prophecy as well as private prophecies such as La Salette. The current period of time the author compares to Rev 12:6 where the "woman" flees into the wilderness, likewise the Church is currently in a desert of sorts. The author notes "prophecies are often chronologically disjointed (particularly so throughout the Apocalypse), and quite often can only be understood when broken down into seperate oracles and then arranged in accordance with the chronological sequence already established in other prophecies". The sequence of events he believes will occur are: the Great Apostasy (which we are currently in), then the Great Sign/martyrdom of a pope, which is followed by the Second Pentecost. After which is the minor chastisement/mega-tsunami, followed by the reign of the Antichrist, which ultimately leads to the Battle of Armageddon/Great Chastisement/End of the world. Whilst there is a heavy focus on the past 100 years events to the end-times, as another reviewer mentioned O'Regan describes how humanity arrived at this point as it didn't happen overnight. * Linking the Blessed Mother's appearance during the Church approved apparition of the late 1960s in Zeitoun Egypt when abortion was first legalised in western countries, to the original escape into Egypt by the Holy Family during Herod's slaughter of the Holy Innocents (salvation history has a way of rhyming). * The millstone that will be cast into the sea (Rev 18:21) and the mountain of fire that will be thrown into the ocean (Rev 8:8-9) which will destroy "the whore of Babylon" could well refer to the collapse of the Cumbre Vieja a volcano situated in the Canary Islands that prominent scientists such as S.N. Ward (Institute of Geophysics and Planetary Physics, University of California) and S.J. Day (the Benfield Greig Hazard Research Centre at University College, London) believe will collapse into the ocean on the next eruption (or due to the eschatological earthquake as O'Regan posits) due to a number of fissures that has made it extremely unstable thus generating a mega tsunami that will devastate the east coast of the US and also much of Western Europe. Refer to blog for comprehensive explanation. For those who are wondering whether the full third secret of Fatima was fully revealed by the Vatican early in the new millennium O'Regan puts this to bed with meticulous analysis, this chapter is worth the price of the book alone. Unveiling the Apocalypse concludes disputing the non-neutrality of technology and how it ultimately enslaves man despite having obvious benefits and relates this to the apparitions of Fatima and Akita - in particular mans use of technology in IVF, genetic modification, embryonic stem cell research and abortion will result in the angel with the flaming sword responding to protect the "Tree of Life". He also notes rather than being depressed about the great chastisement heading our way we should look forward to the Parousia and the "New Heaven and New Earth" that will ensue. O'Regan makes it clear that these are his thoughts and he is simply putting all the information together in a way that makes sense to him after years of original research and mentions there have been great Catholic saints in the past who incorrectly thought their generation was that of the last days thus highlighting his sober and realistic attitude toward interpretation of prophecy. The 5 star rating is given due to the scholarship, research and robust analysis that have gone into the work to integrate Catholic prophecy and major historical events in a framework that makes sense often highlighting remarkable yet obscure interconnections between various historical events. It certainly brings biblical prophetical texts alive and is a brave effort considering most theologians will only view Revelation in a preterist sense. Also worth considering are Fr Vincent P. Miceli's Antichrist, and Harvard professor Carle Zimmerman's Family and Society, a historical book that documented ancient civilisations in which immorality was rampant, the family unit broken and child sacrifice prevalent were eventually destroyed.